Colombian passionfruit is scarce for the coming Easter period. “We’re anxiously looking for new supply of passionfruit from Colombia, but unsuccessfully so far. We managed to find some passionfruit in Kenya and Zimbabwe, but our customers prefer Santana passionfruit from Colombia. The supply is smaller than demand in Belgium, and prices for greenskins are rather high, about 8.50 euro per crate. Another alternative is passionfruit from Vietnam, but that supply is also very limited,” Jan continues. Limes are hardly in stock as well, and prices are around 9 euro per crate. Some batches of Brazilian limes are still in stock, but quality leaves something to be desired. It’s difficult to find Mexican limes at the moment. “In green asparagus we’re still supplying Jumbo-sized product from Mexico, but the Spanish production from the Malaga region started about two weeks ago. In other words, there’s plenty of supply, domestic green asparagus are available as well. 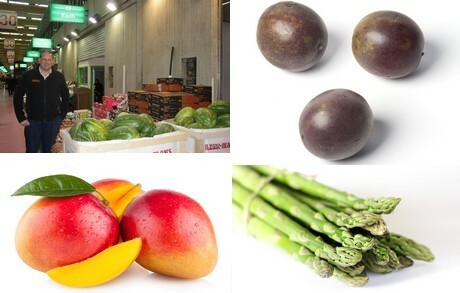 However, supply of asparagus tips from Thailand and Peru is limited. These are often on Easter menus in Belgium, but there’s a shortage in supply,” the trader says. “As for the daily supply of Kenyan French beans, there were some problems in recent weeks. Because of the dry weather in Kenya, supply of beans and legumes wasn’t sufficient. We’re now waiting to see how the Easter week will be. Extensive experience shows there will naturally be a scarcity around Easter, as with the Colombian passionfruit. This is the case almost every year, and that’s why we’d recommend placing orders as soon as possible,” Jan concludes.